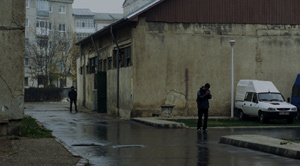 Police, Adjective is a minimalist Romanian film which means it probably won’t get much love from the box office. However, if you’re not completely turned off already, then you may like this film. Our protagonist is Cristi (Dragos Bucur), a cop who spends 8 days tailing some kids known to be smoking dope. His bosses want him to make an arrest. This cop would rather go after the supplier, if not drop the whole matter and let kids be kids. No other country in Europe, he says, arrests people for smoking joints. I won’t tell you the outcome, and you won’t even be missing much because it’s just one scene at the very end. Most of the movie is the torturously slow process of following the suspects. There are many scenes of people waiting — of cops staking out schoolyards and parents’ houses. There are scenes of Cristi and his wife eating dinner in their very humble home. We watch our cop chain-smoke cigarettes and at first and it is an unremarkable movie trope. But after spending so much time with him on stakeouts, we start seeing it for the horrible addiction it is, a symptom of the boredom his job entails. The slow pace may be unbearable for casual viewers, but it illustrates the life of a cop — well, our cop — and seems to be cheekily accusing genre cop movies of lies and exaggerations. Still, boring is boring, and Police, Adjective is almost too pointless to recommend. But a scene at the end won me over. It’s been 8 days and the chief of police calls Cristi into his office. When he says he is reluctant to spend any more time on the case, the chief uses his authority to humiliate Cristi and his partner. The scene actually plays a lot like a Quentin Tarantino scene. That’s not to say it ends in a bloodbath, but rather that it plays like a long game of cat and mouse with one character carefully, deliberately taunting the other. It involves a dictionary. In passing, reference is made to “police, adjective,” which on reflection is a pretty good title for this film. When “police” is used as an adjective it usually modifies “state” meaning a place where law and order overbalance liberty, which is not only the situation our detective is trying to fight against, but also the situation he finds himself in with his boss. I’m hard pressed to defend Police, Adjective to an unsuspecting consumer because of its pace, but I was heartened to see it on some notable movie lists at the end of the year. If’ you’re not afraid of a slow-paced film that bucks the stereotype of cop movies, look up Police, Adjective.